Conrad Schick was born in Switzerland and first came to Jerusalem with a group of men who planned to teach the local young people vocational trades. This group soon disintegrated, and Schick eventually married Friederike Dubler, a German missionary. Schick became well known as an architect and city planner. He also became involved with some of the late 19th century explorers. He surveyed significant parts of the Old City, and built models of the temple mount and other structures in Jerusalem to use in teaching. 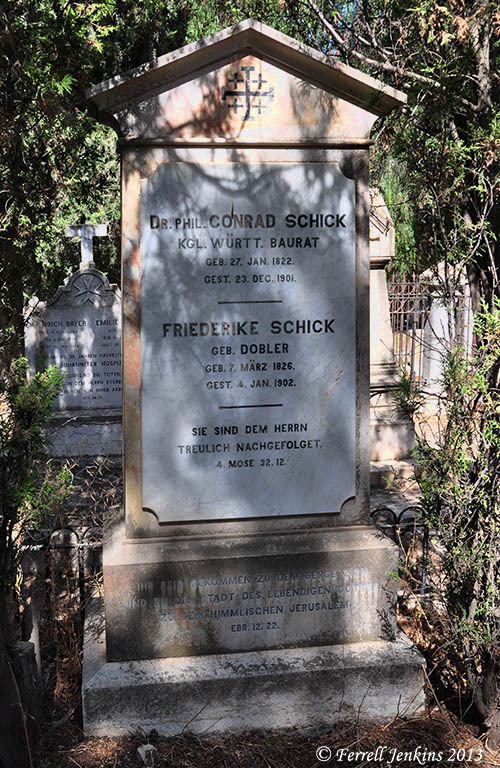 Schick and his wife are buried in the Protestant Cemetery on Mount Zion. Grave marker for Conrad and Frederike Schick. Photo by Ferrell Jenkins. Epitaphs are often fascinating. This grave stone includes two Scriptures in German. 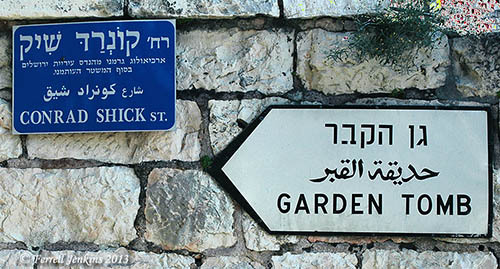 The short lane leading from Nablus Road to the Garden Tomb is named for Conrad Shick [Schick]. Conrad Shick Street leads to the Garden Tomb. Photo by Ferrell Jenkins. Tom Powers has prepared an article about Conrad Schick, and I have made use of it in this post. The entire paper is fascinating. See here. There is also a page devoted to Schick here. Special Note: If you have any interest in the American Colony, and other people buried in this cemetery, please take a look at the comments by Tom Powers (Outremer) following the two earlier posts about the Spaffords. This entry was posted in Archaeology, Bible Study, blog, Culture, Israel, New Testament, Old Testament, Photography, Travel and tagged Conrad Schick, ferrell jenkins, heavenly jerusalem, Jerusalem, Protestant Cemetery. Bookmark the permalink. Lawson, thanks for the note. I would like to elevate the link to your comments here. Many thanks for pointing folks to my article — Schick is a fascinating character indeed. By the way, he was actually born in Germany but received much of his education in Switzerland and was sent by a Swiss missionary society to Palestine.